It appears to have become a factor of some of the LX games that the first challenge is actually getting into the ground. 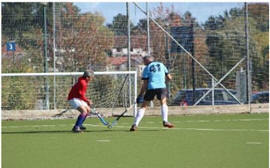 As most of you will know, Isca make use of the hockey pitches located on the Exeter University campus. However, on the 19th October, the campus was virtually cut off due to road closures for the Great West Run (the Exeter 1/2 Marathon). As a result most of the team had a grand tour of the North of Exeter but all arrived on time – just! 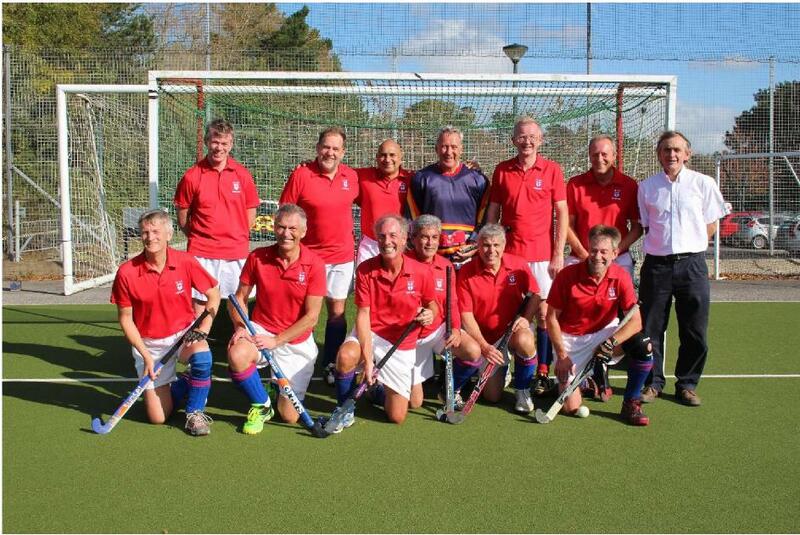 This fixture saw a reunion of most of the LX Red squad that played in The Hague at the beginning of the summer. All knew that we were in for a tough time playing a ‘younger’ side though two LXers were playing for Isca, Alan Muller and John Smith. However, following Jon Marshall’s words of wisdom before the game and with the running of the substitutions by Brian Hiscock, spirits were high. The game started with Isca taking control initially while LX found their feet and adjusted to the tempo of the game. Once the adjustment had been made LX played their way back into the game and started to play a lot of their hockey in the Isca half putting them under some pressure. A loose pass back by Isca saw Richard Slator pounce on the ball in the Isca ‘D’ only for the shot to be deflected off the end of the pitch by a last minute defensive tackle. This period of pressure did result in LX winning a Penalty Flick which was duly put away by Stuart Forrest. As one might expect, this stunned Isca into action and up went the pace of the game. However LX managed to ride the storm and a 2nd goal came from a counter attack when Andy Fraser neatly put the ball into the net from a hard cross from the right wing. This merely irritated Isca further and LX ended the first half playing some very sound defensive hockey and Martin Ferritt keeping the ball out of the net. The second half was rather a different story. Isca played at pace and kept LX pinned into their own half for long periods of time. 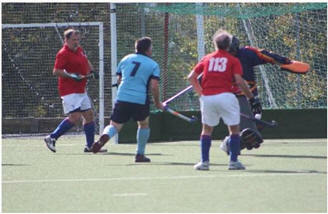 Despite the best efforts of the defence and Martin, Isca claimed their first goal. The game continued in this manner with the occasional break by LX and it was from one of these breaks that Max Jason deflected a hard drive into the ‘D’ from Richard Slator to give LX their third goal. Isca continued to apply lots of pressure but sound defensive work, excellent goal keeping by Martin and some wayward shooting by Isca saw only one more goal scored leaving LX to come away with a hard fought, but very pleasing, victory. After the match LX retired to Café Andre for some excellent hospitality provided by Bill and Catherine Goodridge. This made a fitting end to an excellent day, some very good hockey, sunshine and food and drink. Thanks to Jon Marshall for doing all the admin activities, to those of you who spent hours in cars to ensure the squad reformed, to ‘Man of the Match’ Martin and, especially, to Bill & Catherine.